Package includes roundtrip ticket from Bangkok-Samui-Bangkok, 2 nights accommodation with ABF, roundtrip transfer from Airport-Hotel-Airport, City tour around Samui Island including lunch! Package includes roundtrip ticket from Bangkok-Phuket-Bangkok, 2 nights accommodation with ABF, roundtrip transfer from Airport-Hotel-Airport and half day Phuket city tour. 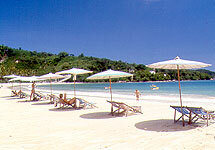 Price starts at USD 210.00 per person (Twin sharing) at Patong Resort, located at Patong Beach. Package includes roundtrip ticket from Bangkok-Krabi-Bangkok, 2 nights accommodation with ABF, roundtrip transfer from Airport-Hotel-Airport and full day Phi Phi Island Tour. Price starts at USD 238.00 per person (Twin sharing) at Krabi Resort.